These Baby Monitors May Explode! 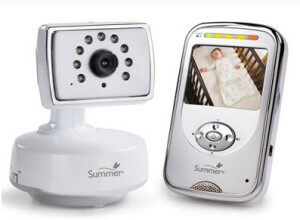 If your baby has been injured or your home has been badly damaged by a Summer Infant video baby monitor, call Carr & Carr Attorneys at 1-877-392-4878. Video baby monitors are supposed to be a safety product to help parents keep an eye on their babies. But what happens if the product you trust to help you maintain a safe household turns out to be dangerous? According to reports on the Consumer Product Safety Commission (CPSC) website, some parents have had problems — exploding monitors, melting battery casings, fire, scorching nearby furniture and smoke — with various Summer Infant brand baby video monitors. March — Noticed a burning smell coming from the monitor, then it started smoking. Tried to use the monitor a few nights later, this time with a different electrical outlet in a different room; the problem repeated itself, the unit was very hot to the touch. February — Went to bed, leaving one of our two baby monitors on, downstairs on the living room sofa. Woke up to smoke and a burning smell, only to discover that our baby monitor was about to catch fire (from the monitor itself, not the cord) and an area of couch was scorched. June – Battery exploded or ruptured and caused the battery case to become dislodged. July — Battery in the handheld monitor spontaneously exploded and ignited nearly burning our house down. February — Nanny arrived home to find the house engulfed in smoke; the fire department confirmed that the baby monitor had caught fire. April — The unit was running hot for about a week; set it down and heard a loud pop and the screen was cracked and pieces were everywhere. Couldn’t figure out why it had a mini heat explosion! April — Monitor was on the charging/viewing stand. Very hot to the touch. Unplugged and let cool off. Next morning we opened the battery compartment. Battery seems very puffy. April — Picked up the monitor in the middle of the night and it was extremely hot (normally not hot at all), it was so hot I got nervous having it in the house and took it outside until it cooled off. Battery over heated so much that it may have fried some circuits in the monitor unit itself. April — Baby son reached for the monitor and grabbed it in his hands, quickly dropping it and crying. His hand was red so I felt the monitor and it was extremely hot. July — Smelled a hot, metallic smell and couldn’t figure out where it was coming from. .After about 5 minutes I picked up the baby monitor and it was extremely hot. My fingers got scorched from it. At that point I realized the smell was coming from the monitor and unplugged it immediately. The charger had melted into the monitor. August — Used this baby monitor for about 6 months, all of which time wall power adapter would get very hot. I then noticed wall power adapter plug started to crack on the parent unit. Within 1 to 2 weeks, it completely cracked open so that you could see the inside of the plug adapter. This could have caused not only a fire but God forbid one of my babies had touched it! November — Blew up Monday evening; made a very loud noise then sparks and smoke came from the monitor, which no longer works. While none of these problems have resulted in severe injury or the death of a child, the potential for serious injuries or fatalities certainly exists. Imagine the hazards that could have become life-threatening if they had not been noticed when they were. A smoldering monitor sitting on a couch could easily start a horrific fire. There are numerous model numbers for the above complaints so it is possible problems are widespread among different versions of video baby monitors. Carefully check your monitor and if there is a problem, stop using it immediately. If you’ve been injured or hurt because of a defective video baby monitor or something similar, please contact the personal injury attorneys at Carr & Carr. We might be able to help you receive compensation allowed by law for damages or injuries. We work with individuals and families across the United States who have been hurt by dangerous products. It doesn’t cost you anything to call and talk to an attorney to see what options you have. I was injured without my seatbelt on. Do I still have a case?